The users of my FREE Stock Portfolio Tracker, which tracks stocks that you own by transactions are complaining that their prices were not updating. Specifically, the Yahoo prices on Yahoo Data Ref are not updating. And they were wondering if its my spreadsheet acting up again. What happens is that Yahoo, which got bought over by Verizon, decided to shut down the Yahoo Finance API, which they deem we are using not legally. This affects not just my Stock Portfolio Tracker. Many folks get their live prices and data through this method for their website, Microsoft Excel and other form of software. You are likely not the only one disappointed. I am too. I use my stock portfolio tracker as my main way of tracking. This comes shortly after Google have decided to take down their stock portfolio feature. So this have not been a good week. In the past we have some outages. Some of these are due to how Google Spreadsheet handles the data calling. Some of it is due to Kyith’s incompetency in implementation. Some of it is due to the Yahoo Data. This time it is likely this Yahoo Data Source is dead. So this means that you need to rely on other data sources. 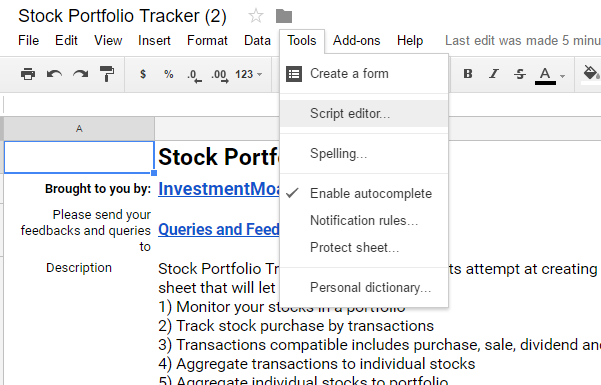 The Stock Portfolio Tracker takes its prices from Google or Yahoo. The natural fallback plan is to use Google. If your portfolio contains USA and Hong Kong stocks, Google still have prices for those. Your impact will be less. But if your portfolio have exchanges that is not supported by Google (for example Singapore), you will face a problem. You will need to find alternative data sources. If you have those, you might be able to integrate them into the stock portfolio tracker. One solution is to manually update the prices. There is a reason I came up with a manual price column. It is meant for situation like this. If Google and Yahoo Stock Prices are not working, manual price will take over. Since I have a lot of stocks in Singapore, and I am sure there is a sizable chunk of people who have, I need to come up with some solution. As investors, not traders, we just need our prices to be updated once per day. So what I did is to host the end of the day SGX prices on Investment Moats. This prices will be updated in the evening for a trading day. 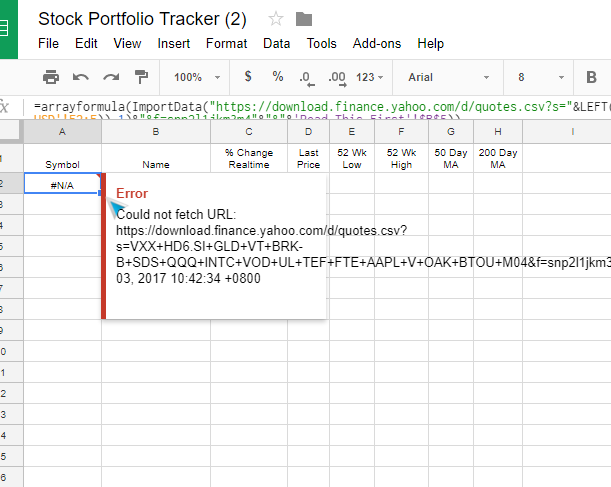 You can modify your Yahoo Data Ref to point to a specific Investment Moats url, to update your Yahoo Data Ref. You can then pull the prices for your stocks from this list. 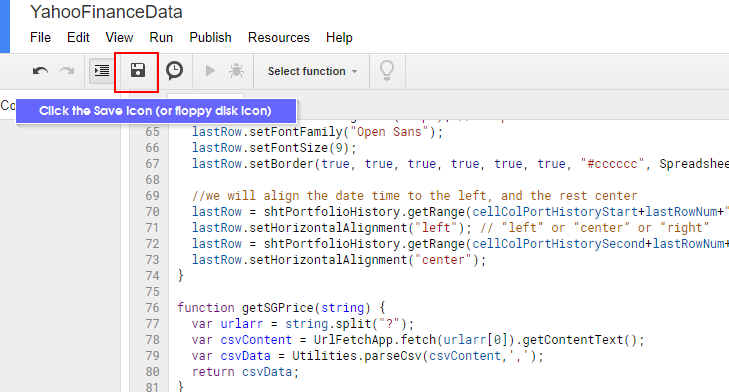 This will launch the Google Script Editor, which provides you with the back end functions to do funky things. This function takes in the formula from your spreadsheet, then split it to remove the part behind the “?”, then fetches the data. This will make use of our custom getSGPrice function rather than the build in importdata function. You will see a list of 1000++ stocks and their latest prices. 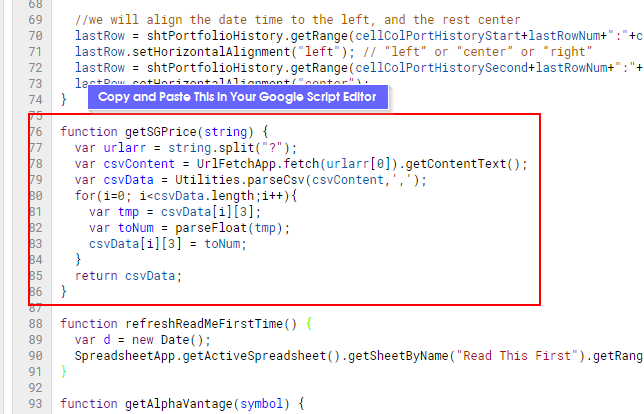 If you are using a Time Trigger to Keep the Google Spreadsheet to refresh the data, you can set the time of the interval to 1 hour as it does not have to be so frequent. You can even set it to one day. Go to your Stock Summary. Remove the “.SI” from your Yahoo Quotes. You should start seeing your “Yahoo Price” in column G updated. Some of you might see that certain Yahoo Quote that is all numbers not working. The reason this is happening is that your column E is not formatted as plain text but as numbers. When you try to look up at Yahoo Data Ref with a number it doesn’t work. To get it working, we need to format the whole column as plain text. Then go to Format > Number > Plain Text. Your stuff should get working again. I do not wanna recommend a scraping solution because if the website that you are scraping from changes, then the scraping needs to be modified. And I would have to tell you about it. And that is just too much effort. Is the Stock Portfolio Tracker inferior now? I think we lost something vital but for me the beauty of the Stock Portfolio Tracker has always been its ability to track what you own by buy, sell, dividend, stock split transactions. Whether price updates automatically is a good to have. For some users, Google prices currently is there, and for Singapore users, with this work around, the only tired person is Kyith. Unfortunately, if your exchange is not supported by Google, or not in Singapore you have to find the way to get the prices, and they might eventually still integrate well in Stock Portfolio Tracker. Did you guys find some other data sources? What other alternatives are out there for you? Your stock tracker is the best! Thanks Mark, I am trying my best. Hope you can get it to work. Hi Kyith, I pasted the new formula on the A2 cell but it did not result in the listing of the 1000+ stock codes/ prices etc. Is there an updated version of your tracker we can download? i really like your stock tracker very very much. Whoa that matters? Thanks for letting us know! i having problem with this new formula. Thank you for the solution Kyith! i was wondering why my prices weren’t updating and thought the fault was on my part, your post clears everything up together with the next best thing, a solution to it! Much Appreciated! Just wonder who is your new data source and what time is your data refreshed? The source is from SGX end of day price data. The data gets refresh when i refresh it. below url works for me under the google price column to access sgx prices. Seems like Google Finance is not able to display all correctly. I will try SGX method. Firstly, thanks so much for hosting this information, end of day data is good enough for me since I just want to know the value of the shares that I am holding. Not using it to do intra day trades etc. Hi Hong Wei,the issue is that ‘Read This First’!$B$5 is suppose to reference a worksheet called Read this first. It is used to help with refreshing the data periodically. If you do no have that worksheet, you will encounter an error. There is a comment in the article toward Kyith that is total inappropriate and inaccurate. The outages is solely due to Yahoo’s poor support in the past and now due to Yahoo discontinuing their API Service. Many other companies and users who have used yahoo’s API over the years are also impacted. We should help Kyith to find an alternative API service so that we can all enjoy this fantastic Stock Tracker tool Kyith has built. I am trying out Alpha Vantage, and if it works out I will post my replacement solution. Hi Chets, Thanks for trying out Alpha Vantage. It may be doable but I think we have to implement it in script form, i will let you guys know if I found something. Hi Chris, for some reason i got parseError, i cannot get it to work sometimes. Thanks Chris! It is working for me. I have made some slight modification to it for now. Hi KPO, i hope you tested enough. I don’t think it works fully. Some refinement may be required based on your personalized spreadsheet. I also started looking into Alpha Vantage, but am not able to pull non-US stock. Has anyone tried? I’m also having issues to pull the data from Alpha Vantage. Still trying but may just end up resorting to Google Finance. If you get Alpha Vantage working please share it over here. I looked further into using Alpha Vantage and I think that’s the way to go. I used KPO’s script and did updates via “getAlphaVantageSlowly” – that solves the problems when pulling to much data at once. They also announced today enabling queries of multiple stock quotes with a single API request. Tested that and it works too. I am using mostly US and European stock symbols and can get most of them. Tested also A17U.SI, since I think most users of Kyith’s sheet use Singapore stock. Only issue I found is the with updates of mutual funds – looks like they’re publishing that data only at the end of trading day. I will focus on using Alpha Vantage from now on instead of trying other sites with not always stellar results. Kyith – Thank you so much for all your hard work. This is by far the best tracking sheet I came across! Hi ChrisD, were you able to get the batch quote to work in Singapore, what is the function string that yo use. I don’t seem to be able to get it to work. I noticed that Batch quotes doesnt work for .SI but time series does. I have sent them an email about this bug, if they revert back Ill update this. I think currently they are only accept working with the USA stock quotes. It was on their site. I saw this 2 days ago. Something must have changed. I had tried and saw results. Is it possible they are still working on bugs after the release? Karthik – thanks for mailing them. I hope they can work it out. These are my Data Ref formulae, maybe someone will find them useful. I’m reusing the same query in the hope that Google Sheets is smart enough to cache the results. Thanks to Chets for providing a good starting point. Thanks Laur, i will look into it! I am using your formulas and all work fine, but the Dividend one. Getting a parse error and tried to alter the usual suspects (quotation marks, etc.) and values, but can’t get it to work. is it working for you? On another note – I switched to the “KPO” solution with Alpha Vantage for the daily values and it’s working great so far (including European stock symbols.) Guess the trick is not to pull too much data at once, so the “delayed” version is the way to go. Thanks everyone for trying and testing new solutions! Thanks Kyith for the workaround. Just a quick question, what time do you pull the end of day prices? When i return home. for example its 7 pm today. Currently using your tracker as well as Stocks.cafe to track portfolio. Hopefully both will survive too! You sir, are a legend. Thank you for your hard work and effort! Thanks. Have been using your sheet ever since I have started investing slowly. Given than both yahoo and Google are not working now and you went to make a round about, that is very nice of you. Why are the 52 week high/low and 50 MA and 200 MA not functioning as well? Hi SK, because I do not have anymore data sources for that. May I know why some of the stock price cannot be shown in the stock summary ? The price only show “–“. 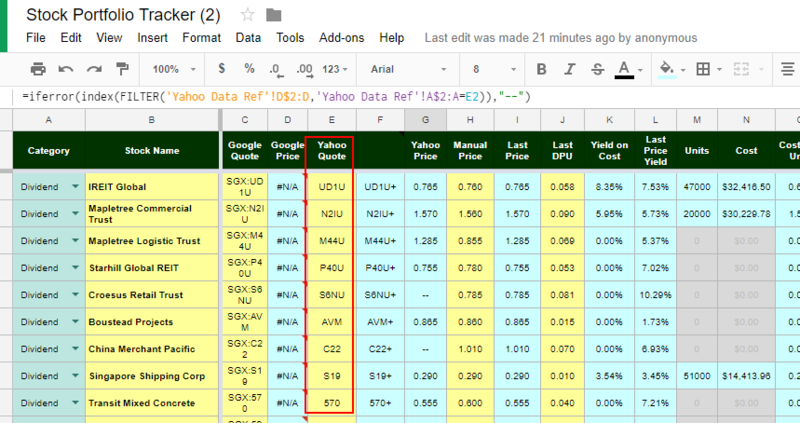 I went to the Yahoo data ref sheet and the price of both these stocks are shown in the sheet. e.g Tai sin electric and noble group. Thanks. Hi Ron, is there a mistake? — is when the stocks are delisted or they cannot retrieve any symbol. I’m facing the same issue with Teck Wah and Transit Mixed Concrete. The prices show in the Yahoo Reference Spreadsheet but are not pulled over to the stock summary. Incidentally I realised that Tai Sin, Teck Wah and Transit Concrete all have only numbers in their stock symbol. Could that be causing trouble with the formula? Thanks alot for your dedication to this. Hi Matthew, strange, i have Transit and UMS which are both numbers. They are showing up. We are talking about my work around right? If you want you can make a copy then share with me ([email protected]) and i see what is wrong. I’ve found that using the free API at IEX integrated with a custom IMPORTJSON function that someone wrote works great. It provides a ton of financial data and is very easy to use. Thanks for the workaround. I guess we are all heavily dependant on you now. Please do not close/stop the service. lol. Using the pricing feed from Bloomberg seems to work for me so far. Thanks for the Bloomberg idea. Unfortunately it’s not working for me. What am I doing wrong ? That does give a quote on their website. 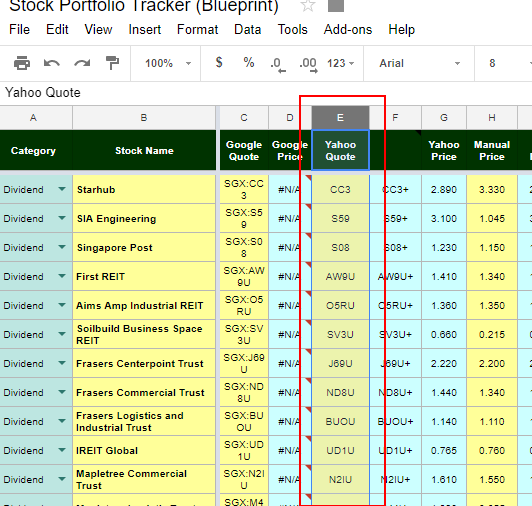 This article is a lifesaver for the average joe managing and tracking their portfolios! Have tried the Bloomberg method posted by Sam (it works for all my SG and HK stocks except for one which returned a #NA value – not sure why ). For that affected counter, I used the google finance query posted by ed, and it works too ! Hi KH, i think it will still run into some problem. I have a question, is there a way to extract the book value of the company into excel as well? BTW: Thanks a Lot! You are a true lifesaver! Hi Antony, you need to find the source. I believe for other countries, Google do provide the data. If you can find the source it might be doable. I got an “Formula Parse Error” when I use your formula. You just cut and paste this formula into the cell and change the stock code for individual stocks? Kong, good link! it is working for me! 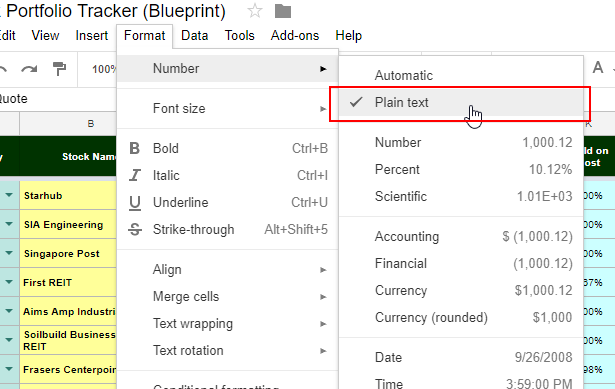 Formula Parsing errors often happen when you copy and paste a formula into Google sheets. Try to replace the quotation marks or make sure you paste text without formats. Kyith brother! Thank you for the workaround. One day update is good enough for me and thank you for hosting the end of the day SGX prices!!! God Bless You!!!! BIG KISS! thank you so so much!!! I’ve been using this since 2012 and it’s a godsend! Hi Jasmin, no problem. Hope this fixes your issue. Long time fan and user of the tracker, which I thank you so much for supplying this tool. I use this within Australia and the 1,000++ stocks with the update do not include any from ASX. Can you help me with a solution for the ASX stocks? Hi, this works for now but no guarantees it will work in future. Hi Momo, how many stocks did you try this with? Hi Jc, i am not using this scraping. Kyith, thanks for your response. Great work! It’s a good work around. Thanks, Kyith! For the examples above, you have to replace all the double apostrophes with the ones from your keyboard (seem google sheets treat the curly ” different from the keyboard one, and ensure there is only 1 opening and 1 close bracket (….). Hi ash, thanks for the advice there. Just wanna know if you manage to get it working on a list of 80 stocks. Thanks! The following site has some useful tips. I currently have Bloomberg, WSJ AND Share Investor working. I found solutions on the following site. As of today (8th January), I got downloads for Singapore Telecom from WSJ, Bloomberg AND Share Investor working. One can never have too many options. 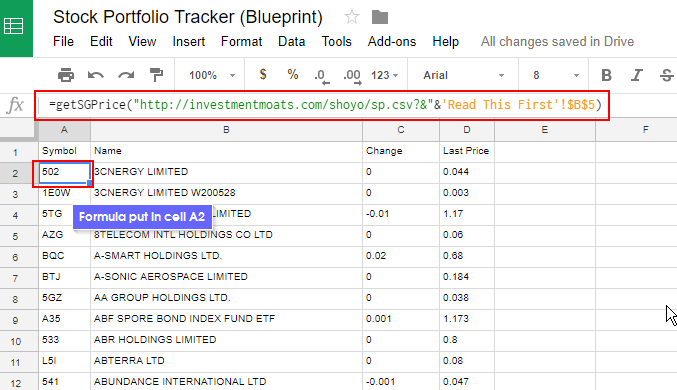 Hi everyone, is there any way to get metrics to automatically refresh on google sheets such as book value, P/B, dividend yield, dps growth, etc, using external data sources since Google Finance formulas dont include those? Which sheet do I go to perform step 3? I can’t find one that has a correct A2 cell. Its wonderful for me to discover your stock tracker as its so well designed for DCA users like me. I have been searching high and lows in your site regards to adding foreign exchange such as Amsterdam exchange into the yahoo finance data however, I am not able to dig out any thing about it. May I know how can I make a yahoo finance data reference to Amsterdam market ? Hi Eugene, Yahoo Finance stop us from using their data. However, Google Finance is still functioning. If you look at my spreadsheet there is a column on getting the Google Finance price. For Amsterdam, you add an “AMS:” in front. So for Gemalto it is “AMS:GTO” Congrats this will work for Holland and Dutch folks!